Don’t worry. The truth is not out there. There actually is something wrong with your television. Don’t swing away, Merril, because Mel Gibson is nowhere close to this one. What we got here is just a good ol’ fashion prank by the locals combined with some swamp gas. No really. Just because the locals are highly de-evolved aliens and the swamp gas is vapor formed from motes of raw magic-infused primal water does not mean anything supernatural is going on here in the least. Really. No, seriously. You’re not buying this at all, are you? But maybe, just maybe, there is more to this than we previously thought. 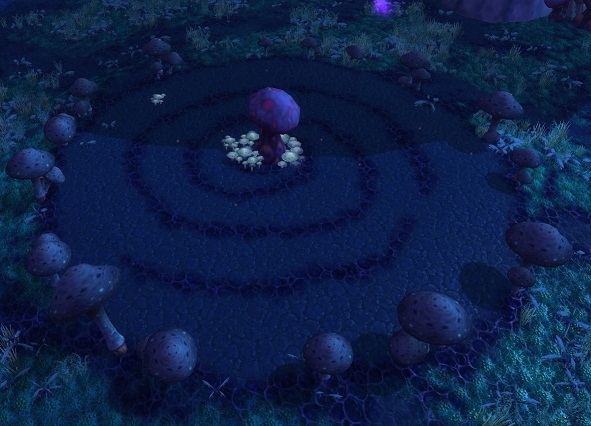 Maybe there is some kind of intelligence life in Zangarmarsh that we have not seen yet (I would think that intelligent life would stand out amongst ogres, mushroom people, lost ones and hippies) that is crafting this circle in means to send a message to the lower life forms. The circle could represent unity, and the mushroom at the center could represent… um… mushrooms? Yes! The mushroom is obviously a holy symbol in Zangarmarsh. Blessed by some Myconidian god that watched over its chosen lands with a spongy fist! (Don’t worry, he’s not that scary, really he is just a Fun-guy! Wakka wakka.) This circle is not meant to be a crop circle but an alien forged mushroom Virgin Mary appearing before us. Now the mushrooms on the outside must represent the rest of us, so distance from our fungi lord and separated by a massive swirling vortex! Wait. A massive swirling vortex? Like the Maelstrom? The one Deathwing just came out of? Oh my shroom, the “people” of Zangarmarsh worship Deathwing! This is bad, this is very bad. Must make an alternative interpretation. That will fix everything. Just like it does in the real world. Umm… maybe the swirling thing is the TWISTING Nether? Yea. There we go. The Mushroom God resides in the depths of the Twisting Nether. Well, I’m sure there’s nothing… It’s Kil’jaedan isn’t it? You have to be kidding me! Is there any form of life in this game that doesn’t worship some kind of evil being? Heck, even the Naaru can be complete $%^#&#*@s some times with their whole “Those who don’t worship the light will killed” thing and as for the ‘peaceful’ shamanistic worship of the elements? Well, hellooooo Ragnaros. Don’t you druids think you’re getting out of this either. Your goddess Elune unleashed the worgen upon the world in the first place as some kind of cosmic joke. And considering how often these uber-powerful deities. demons and demi-gods are set on causing destruction, I’d like to suggest something to Blizzard. How about for the next expansion we get an atheist hero class? Yea! You could defeat things with the power of science, logic and condescending remarks! Wait… what we’re we talking about again?